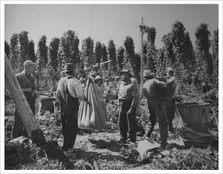 From 1902-1950 the BC Hop Company operated over 300 acres of hop yards in the Fraser Valley. The rich history of hop production in our region echoes once again as the first of many new hop yards have begun to spring up across this fertile region. The modern BC Hop Company is dedicated to harvesting, processing and distributing the result of our Partner Farmers hard work and expert growing skills. Whether your needs are those of a large brewing company, an up and coming craft brewer or a local florist looking for the latest accessory in floral design, we have an expert to help with your questions. We are currently developing products with brewers, culinary experts, naturopaths, and leading floral designers to use our hops in both traditional and innovative ways.